Red figured silk satin with floral motif; blue and yellow silk embroidery at hem; fly fringe and tassel ornamentation. The round gown is a one-piece dress with a high waistline reaching just below the bust. Around the time of the French Revolution in 1789, the gorgeous Rococo-style dresses shifted to simpler styles. Although women's dresses had consisted of a robe, a petticoat and a stomacher in the Rococo age, in this period the bodice was united with the skirt. 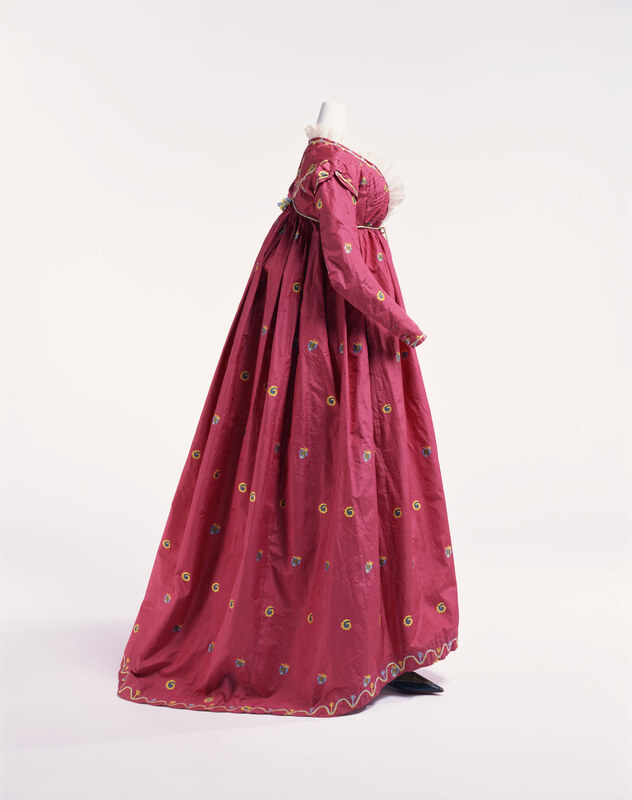 This gown is called a round gown, because of its shape. It often appeared in fashion plates by Nicholas Heideloff in his "Gallery of Fashion" (1794-1802, London).